The celebration of the fiestas in honour of San Fermin dates back to 12th century medieval Pamplona, when the settlement did not go beyond the area known as the Navarrería. 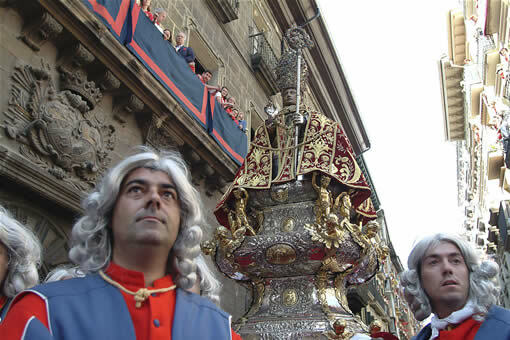 San Fermin is considered to be the first bishop of Pamplona. From a religious point of view, this celebration commemorated the martyrdom of St Fermin in the city of Amiens, and a relic of the Saint was brought from this city by Bishop Pedro de Artajona in 1186. From that time onwards, the devotion to the saint was gradually consolidated over time and even more so when, two centuries' later, another relic was brought to the city, and devotion to the Saint was extended to include the nearby settlements of San Cernin and San Nicolás. During this period the fiestas held in honour of the Saint were frugal and almost entirely religious: the Vespers, the Procession, the Octava (eighth mass) and the so-called "lunch for the poor" paid for by the city council. The Fiesta was also related to cattle fairs and bullfights, which are documented from the 14th century onwards. However, at first the religious festival and the bullfighting events took place at different times of the year. However, the people from Pamplona, tired of the bad autumn weather which occurred each year on the 10th October, the patron saint's feast day, managed to have the feast day moved to the 7th July, to coincide with the cattle markets. In 1591 the San Fermin fiesta was held for the first time and, for two days, the people from Pamplona enjoyed the festivities which started with the opening speech read to the sound of a multitude of drums and trumpets. The Plaza del Castillo main square was the scene of a trophy and the Jesuits performed a play entitled "Comedy and tragedy of the blessed St Fermin". There was also regional dances, the procession and bullfights. Year after year, more and more activities were included in the festivities such as fireworks and dancing, and the duration of the fiestas was also extended to end on the 10th July. For years, and even centuries, the Church opposed the changes made to the festivities in honour of St Fermin, festivities in which the people were more concerned with enjoying themselves than with the religious aspect. In this respect, the authorities tried to prohibit the Mécelas in 1537. In these typical festivities in Navarre, the inhabitants of a number of villages came together to celebrate a few days of enjoyment with dancing, banquets and games. Despite every effort made by the clergy and the Parliament of Navarre, who, with the king's support, enacted a number of measures to stop the festivities, they were unable to prevent the people from celebrating the fiesta in this way. As a result, in 1684, all this legislation was finally repealed. However, over the next two centuries, the history of the San Fermin fiesta would continue to be a tug of war between the religious sobriety of the authorities and the festive attitude of the people. The leading church figures denounced what they considered to be excessive expenditure, drinking, eating and a relaxation of decency, and demanded a return to the purely liturgical adoration of the saint. Already during this period, documents reveal the presence of strangers participating in the San Fermin fiestas with their shows. The argument that the festivities were exceedingly expensive led the Parliament to reduce the number of days in 1868, although the Church was not in favour of doing so, not considering this decision to go any way towards eradicating the paganism of these festivities held in honour of the patron saint. In the 19th century, an important landmark for the San Fermin fiestas was the creation of the present figures forming the Procession of the Giants and Bigheads. These were later completed in the 20th century with new figures for the Cabezudos (bigheads) Kiliks (figures carrying a stick with a rope and sponge attached), and the Zaldikos (figures with a paper mâche horse). The dangerous moments experienced in the bull running during this period were also much commented; on a number of occasions the bulls managed to break through the barrier along the route, sometimes with tragic consequences. To prevent reoccurrences it was decided to put up a double barrier. On a more lighter note, the presence of the circus should also be mentioned, with its traditional nineteenth century attractions, and also the fairs. In the twentieth century the fiestas reached their full splendour. New rituals and festivities were gradually included, activities which started out as mere improvisations and which were soon to become a tradition. The Riau-Riau was added at the beginning of the century, when the Carlists led by Ignacio Baleztena thought up a festive way of annoying the Liberal councillors in the procession as they passed through the street of the Calle Mayor. Years later, from 1991 onwards, the Riau-Riau was suspended. The Chupinazo arose in the post-war years when Jokintxo Ilundain and José María Pérez Salazar decided to lend more gaiety to the act marking the start of the fiestas by firing a rocket. 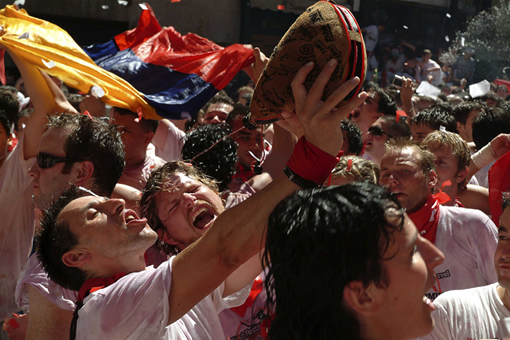 Spontaneously, and simply with amusement in mind, other events gradually appeared within the San Fermin fiestas and which are an essential part of the festivities today. Other examples are the running of the bulls (Encierro) and the short bull run in the evening (Encierrillo). With the turn of the century, these acts were universalized thanks to their popular nature, combining respect for tradition with the fun-loving spirit of the city's inhabitants in a symbiosis between the flavour of the past and the constantly renewed experiences of the present. With the publication of the famous novel "Fiesta", originally called "The sun also rises", written by Ernest Heminway in 1926, readers from around the world discovered the San Fermin festival. The experiences described by this Nobel prize winner served to attract many new visitors to the fiestas and, from that time onwards, the fiestas could be said to be universal. Although the city has become too small to house all the visitors coming each year, the hospitality of the people from Pamplona and the friendly atmosphere pervading the streets, makes tourists feel at home and allows them to become part of the magic of the fiestas. Many people return year after year, just like Ernest Hemingway, and are now an essential part of the San Fermin festivities. In fact, groups from Anglo-Saxon countries and Sweden even have their own specific establishments and night-life. These people have become so much a part of the fiestas that they have even created their own Peñas, some of which date back thirty years. The Swedish Peña was founded in 1975, and this was then followed by the one from Norway and the one from New York.